Throughout 2016, we hosted multiple series of community feedback sessions where we worked to learn and build out our community’s perspective on regional health improvement strategies. In January we hosted our first iteration of Community Linkage Mapping, an exercise we have been building and refining throughout the year where participants inventory their organizational relationships in an effort to build a “map” of our health system. Also in this session, participants broke out into dynamic Idealized Design feedback sessions in each of our Priority Areas. In May we debuted the first draft of our community strategy maps, which represent a snapshot of the feedback we heard in the previous sessions. After, we announced the formation of Community Action Strategy Teams which would meet throughout the summer to validate and expand the identified strategies and decide on appropriate indicators measure. Each was chaired by a BHT Board Member. From June-September, we hosted feedback sessions and conducted individual outreach using the Results Based Accountability framework. 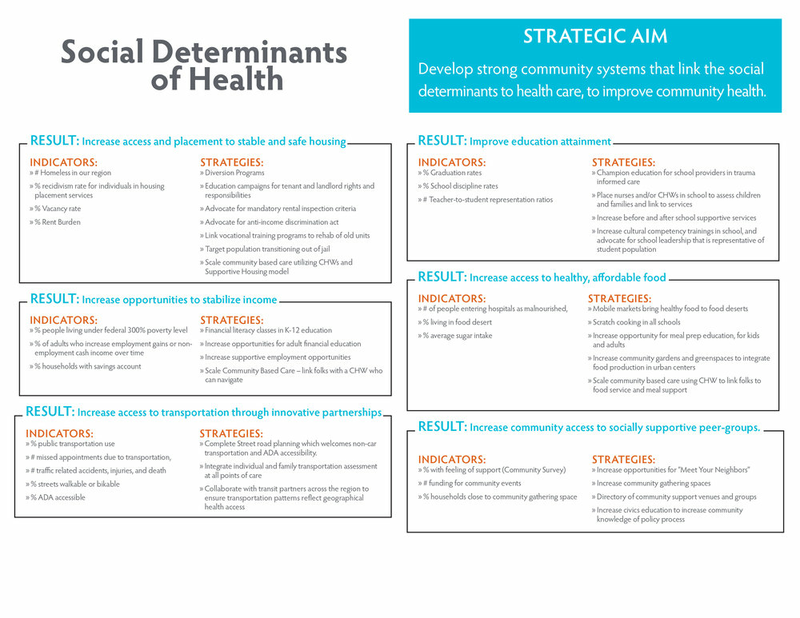 The resulting updated Community Strategy Maps for Social Determinants and Population Health were debuted in September. In October, we began working with the Spokane Regional Health District Data Center to execute a process for finalizing our Community Linkage Map. We will be surveying organizations across the region, asking them to identify their organizational relationships, which we will be able to visually inventory in a “Network Analysis” (example). This network map will help us visually represent where there are gaps of care in our health system. The map will live on the BHT website available for the public to view and explore. We will gather survey responses until December 31st, and expect to have the analysis complete in 2017. When this map is completed, we intend to bring back this systems level view of our region to our Community Strategy Action Teams to validate our strategies and prioritize areas of impact. This meeting featured updates on our Community Action Strategy Teams, our ACH Pilot Project, and Governance Structure. We have slides from these presentations available here. We were thrilled to share out our updated Strategy Maps for Social Determinants of Health and Population Health. Our Community Action Strategy Teams were meeting all summer to help us understand our community’s perspective on regional health needs, and identify goals, metrics, and strategies for moving the needle. These maps represent a snapshot of the conversations we’ve heard. A huge thank you to all of you who donated some of your summer to these meetings. These maps are very much work in progress, and we intend for them to be living documents that are continuously updated as the work progresses and priorities change. Another big update was the announcement of our first selected ACH Pilot Project. Starting in October, we will begin design sessions in Ferry County around a Jail Transition pilot to connect folks transitioning out of the Ferry County Jail and their families to stabilizing services. We wrapped up the meeting with a presentation on the ACH and BHT governance structure. If you haven’t already, make sure you take a look at our Governance Policy which explains in-depth the role of our Board, Leadership Council, and Health Champions and how they intersect. We are currently recruiting for 4 open seats on our Board, and need your help finding the right people to fill those positions. Click here to see our board recruitment packet, which includes more information about the commitment and an application. To apply, you must submit the application, your resume, and a letter of support from a current BHT Board Member or ACH Leadership Council Member, by Friday October 14th at 5pm. We are also working to update and clean up our Leadership Council list. If you can’t quite remember what you signed up for when you joined the Leadership Council, take a minute to read through our recruitment packet. We will be asking all Leadership Council members to renew their Community Commitment to the ACH. Rather than deal with the hassle of asking all of you to print/sign/scan these letters to us, we will be sending out a DocuSign to each Leadership Council Member Organization with a request for contact information of each person who should receive ACH updates. Stay tuned…and as always feel free to email hadley@betterhealthtogether.org with any questions. As of July 2016, the Better Health Together Board of Directors has adopted a revised Governance Policy for our ACH. Take a look here. We have decided to hold off on starting out Integrated Care work group until September. Our Social Determinants and Population Health work groups are identifying strategies that address health upstream, and our ACH Project Team is exploring the Pathways HUB model to see if it fits for our regional project. We feel the decisions made by these groups will be crucial in shaping our Integration strategies, so we've decided to delay. If you want to be involved in the Integrated Care work group once if forms, shoot us an email. The Healthier Washington Community Transformation Team hosts a monthly Touch Base webinar to share updates about Accountable Communities of Health and their developing role in transforming our states healthy system. Thank you to all who joined us to talk next steps for our ACH. And a special thank you to the Health Care Authority for driving all the way across the state to help bring some additional clarity on our role as an ACH. We started the morning with a presentation from Kali Morris from the Health Care Authority on the role of the ACH in Medicaid Transformation. You can view those slides here. In her presentation, Kali made some comparisons to Medicaid transformation work happening in New York, and shared some lessons learned from their efforts. If you are interested in learning more, you can read this report on New York's DSRIP Program put together by The Commonwealth Fund. On the topic of Value Based Payments, HCA also shared this helpful visual on Alternative Payment Models. Additionally, we've made some headway on selecting our regional health improvement project around the development of a centralized community referral system ("air traffic control") based on the Pathways Community HUB model. We will be forming one additional workgroup to explore this model and serve as the steering committee to launch our project. You can take a look at the ACH Project Team Charter here. We are looking for volunteers to join one (or many!) workgroups, with the intent of meeting through the summer, to have Strategy Maps finalized by September 20th. If you are interested in joining one of these workgroups, please read through the above charters and consider which group best fits your expertise, and email your interest to Alison@betterhealthtogether. We also shared with everyone Empire Health Foundation's new Oral Health Access document. Please take a look and feel free to share! That was a big update! But we are thrilled to have some actionable to-dos as a group. Thank you all for your willingness to jump aboard. Hello Rubber, Meet The Road! Over the past 18 months, we have worked hard as a region to prepare for health transformation. We’ve established the right partners at the ACH table, selected priorities, imagined our ideal state of health, and now it feels like the forces of opportunity and hard work are aligning to create the ideal environment for big impact. In some ways it feels like a long road, in other ways, just a start. Either way, the BHT team and I are more energized and enthusiastic than ever before. We see the potential of this work to unleash radical improvement the health of our region. It’s clear we’ve been talking about the right things: Payment Reform, Investment upstream and in community determinants of health, regional decision making and the need to make stronger community linkages. And now we are ready to take this ACH for a test ride. In the coming 90 days we’ll be selecting our regional project, hearing a (hopefully positive) announcement about the Medicaid Waiver and launching further education on the state’s effort to accelerate the change from fee for service to value based purchasing. These big initiatives are about to move from talk to action. I’m proud of our region for embracing this, even when many of us weren’t sure if there was any there-there, but now we’re ready. It’s going to be a wild ride. I’m glad to be here with this amazing group of partners. PS- Our blog is chocked full of great resources on Payment Reform, Access to Care and Prevention news. Don’t forget to check it out. Accountable Communities of Health and Washington State Health Care Authority are getting all excited about Value Based Purchasing...but what does that actually mean? Washington State Health Care Authority releases request for information on Pay For Success programs for Community Engagement in Supportive Housing Interventions. Thanks to all of you who joined us for our March ACH Leadership Council meeting. It was a great discussion and gathering, with a full room of partners in person and online. The State expects to hear in late April if we are successful in our Medicaid 1115 Waiver application. We will keep you posted as we learn more. April is Spokane Gives month, United Way and partners will host a month of volunteer opportunities in Spokane. Check out the volunteer projects here and see how you and your teams can Give to your community. The new Apple Health Foster Care program, Apple Health Core Connections, will launch April 1st managed by Coordinated Care. This new program will bring increased care coordination to children in all stages of the foster care system. A number of organizations are seeing Spring time growth and bringing on new hires to increase their capacity to serve our region. We are especially excited about Newport High School’s hiring of an additional school nurse. And if you are a Bloomsday fan, start training now at Providence and Group Health’s free Bloomsday training clinics. We’ve been synthesizing the wealth of information and ideas generated at our Community Linkage Mapping and Idealized Design sessions over the last two months. We debuted and discussed our first strategy map Priority area: Scaling Community Based Care Coordination. We received helpful feedback to further streamline the use of the maps. The feedback included more context, clear prioritizing and the sharing of the current community efforts for each of our strategy areas. There is much work still to do, so stay tuned! Alisha Fehrenhabcher, shared some of her experiences and lessons learned from her work with Health Matters of Central Oregon on the Pathways to Health Hub model. This model demonstrates a pathway (sorry for the pun) forward for our Scaling Community Based Care Coordination based on an evidenced based practice that is scalable across regions and sectors. We are lucky to have her in our BHT region. Our friends at SNAP Spokane shared their new Low Acuity Transportation Pilot program aimed at reducing the cost of ambulance rides by creating alternative transportation to more appropriate care centers. This is a great demonstration of community entrepreneurship. Go SNAP Go! As always, if you have questions or comments, let me know. Center for Community Health and Evaluation releases Year 1 Accountable Community of Health Evaluation Report.